The two things you love most, your home and your love, come together in Rachel Alvarez's beautiful piece. Your hometown and your love. The two things that make your heart swirl come together in Rachel Alvarez's sentimental piece. 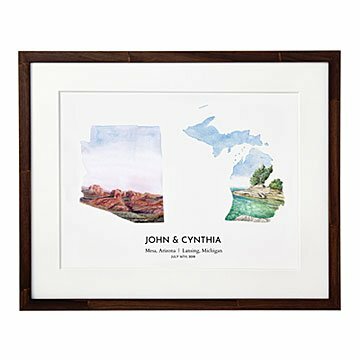 She paints each state by hand (even its complex edges), and then personalizes each with your names or family name and a special date. Choose your individual states or one special place, like where you got married or where home is now. It makes a one-of-a-kind anniversary or wedding gift to celebrate your paths crossing. We think they call that fate. Made in Salisbury, Maryland. Rachel Alvarez lives and works in Salisbury, Maryland, where she graduated with a BFA in painting and photography from Salisbury University. After 15 years in retail, the new stay-at-home mom picked up her paint brushes again during one of her son’s naps. She was quickly dubbed "TheNapTimeArtist" and started taking on custom art projects. When she was expecting their second child, she learned how to paint with watercolors for a safer household, and discovered that she loved the more delicate qualities they brought to her art. Two States Framed: 17.25" H x 21" W, Two States Unframed: 16" H x 20" W, Single States have the same dimensions as above but may display vertically or horizontally depending on the orientation of the state. Single States that display vertically are marked with a (V) in the PDF. I loved the idea of a daily reminder of how we brought together two families in November 1998. We eloped to Las Vegas because he was stationed in OK City and we didn't have a way to include both our families in a wedding. After 20 yrs I wanted a daily reminder of our love and the distance and the families we united that day. Now everyday we will see this over the mantle and be reminded.